IMPORTANT: If you feel in any way impaired please call a friend, a cab or use a mobile booking service like Lyft or Uber. This tool is for educational purposes only. 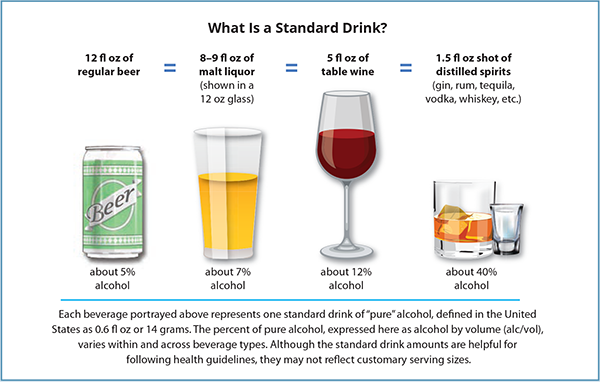 Your metabolic rate, age & how bartender pours drinks may significantly impact your BAC. * Different mixed drinks contain varying amounts of shots in them. Most mixed drinks contain the equivalent of about 1.33 to 1.66 shots of 80-proof alcohol in them, though a Martini or Manhattan has about 2 shots of alcohol while a Long Island Iced Tea or Zombie have about 3 shots each. The above mixed drink calculation is based upon an 80-proof liquor. If your mixed drinks have a different proof then you would adjust the shots per drink to compensate for the different proof. For example, if you had 2 shots of 4 proof alcohol per mixed drink that would be like having 1 80 proof shot in a mixed drink. If you were drinking Bacardi 151 that would be calculated as about 2 shots per actual shot as 151 is almost double 80. IMPORTANT: If you feel in any way impaired please call a friend, a cab or use a mobile booking service like Lyft or Uber. Many people can vastly exceed the legal limits for driving without showing slurred speech or obvious physical signs of impairment. Reaction times are important while driving and anything that slows your reaction time could cost a life. This calculator will help you estimate your blood alchohol level. This tool only attempts to calculate rough estimates and many other factors can impact BAC and the influence of alchohol on a person's ability to drive. A person with low tolerance may be adversely impacted by alchohol at a level significantly lower than the legal limit. Some prescription drugs other circumstances may impact the ability of the liver to process alchohol. Even something as seemingly benign as a tonail fungus treatment may have a dire impact. The above calculator presumes a constant rate of drinking, which rarely happens in relality. Many people start slowly and drink more quickly over time without realizing a change of pace. If you drink over a multi-hour period slowly and binge drink at some point near the end of the drinking period then your BAC will likely be significantly higher than a simplistic estimation tool may suggest. Do not use the above estimation tool or the precise legal limits to justify risky behavior. Please call a cab. Different states use different terms to describe drunk driving. Here are some of the common acronyms and what they mean. Refusing to take a breath test may result in a license revocation and/or blood test. In addition to using different names for driving offenses, states also have enhanced penalty levels for higher levels of alchohol and zero tolerance levels for minors below the age of 21 and people on other court ordered restrictions. Visit your state department of transportation and official state government websites for more legal information and to keep up with the latest changes to your driving laws.